There are few things I enjoy more in life than margaritas and a good vegetarian or vegan taco. So when I heard about Barrio in Tremont - a new taco joint where 806 Martini Bar used to be - I was pretty excited. I was even more excited once I read some Yelp reviews that said they have vegetarian refried bean tacos and tofu tacos. So despite my rule of not going to a restaurant if it doesn't put its menu online (it's a drag to go somewhere only to discover they have nothing for vegetarians), I guilt tripped my boyfriend into going with me last Thursday. I really liked 806 so I was interested to see how the place looked as a Mexican restaurant. Basically it looks exactly the same with some new "day of the dead" ﻿murals and decorations. Interesting. When I walked in the door there was a small sign that said to ask a bartender for a table if there wasn't a hostess available. There was no hostess in sight so I had to elbow my way to the bar. There were two very overwhelmed looking bartenders and it took me about 10 minutes to get their attention and ask for a table. Luckily there were a few empty but dirty tables but a bus boy was able to wipe one down for us pretty quickly. And sadly, that was the only "quick" part of our evening. Not sure how the servers are assigned tables, but our waitress showed up a good 10-15 minutes after we'd been seated - with no menus. 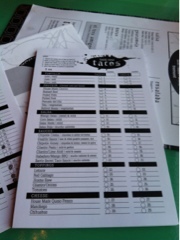 She plunked down the extensive drink menu on the table and gave us taco order sheets. She promised that we'd be getting water and free chips and salsa shortly. And then she dashed off. When our waitress returned, I decided to order a citrus-y specialty margarita. The name escapes me now. (and the drink menu isn't online). My boyfriend got a beer and we tried to order a queso dip appetizer but they were out of it, so we ordered some guacamole. We had a couple questions about how the taco ordering system works, so our waitress broke it down for us. All of the tacos are $3 each. First you pick a type of taco shell - flour or hard or soft corn. Then you pick a protein, salsa, toppings, sauce, and cheese. Easy peasy. You fill out what you want on a nice little order sheet and your order is whisked away to the kitchen. If you don't like tacos, this really wouldn't be your kind of places because they pretty much only serve tacos, salsas, a couple sides, and a salad and soup. Our drinks arrived first. My drink was great. 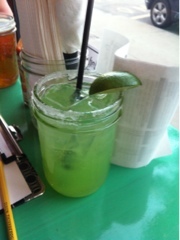 I'd never seen a margarita this color but it was good. It tasted green if that makes sense. But I'm a vegetarian and like "green" things, so it was fine by me. My boyfriend tried it and hated it. About 15 minutes later our waitress reappeared to check on us. I asked if we could have some water and she promised it would show up soon. And it did. But not before I finished my drink. And there was still no sign of salsa and chips. Not sure if this was an accident or they just wanted us to drink faster? So we ordered another drink. And waited. It's been ages since I worked in any sort of restaurant environment, but I get the impression that it's pretty easy to serve up chips and salsa, yes? And I'd think guac would be the same way. Make a huge batch of it, throw it in a bowl, and boom! Shortly after that our chips and salsa arrived. I wasn't expecting green salsa. It was just ok. The chips were great, though. Nice and fresh. 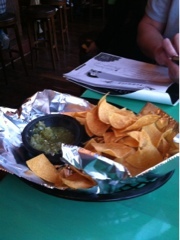 We ate our way through the chips and started to wonder if we'd ever see our guac or tacos. 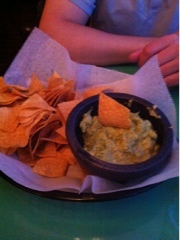 The next time our waitress showed up we asked about our guac. She explained that the kitchen was backed up and that it should be at the table soon. I forget how long "soon" was...but it really wasn't soon. Tables that were seated when we were had their checks and were leaving before our guac arrived. And if I'd known how it would taste, I never would have even bothered to order it. I've never had guac out of a bag in the grocery store (y'know, the kind that has who knows how many chemicals to keep it fresh in the store), but I'd imagine it would taste like this stuff. Boring, bland, and with a weird consistency. We were starving by this point otherwise we wouldn't have eaten it. 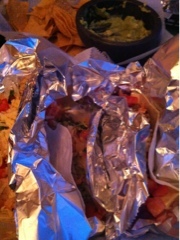 Thankfully our tacos showed up before we ate too much of the guac. I had great hope for them. If you have a restaurant and are going to serve basically one menu item, that menu item is going to be awesome, right? Wrong. I had 2 tofu tacos and 1 refried beans taco in flour shells. The beans were pretty dry and bland and all of the toppings I put on the taco couldn't help to make it taste good. I didn't finish it. The tofu tacos were a smidge better. If you like unseasoned tofu. (but who really likes unseasoned tofu?!) The cilantro pesto sauce gave the tofu a little bit of flavor but not enough to make it great, in my opinion. My boyfriend's tacos weren't much better. He enjoyed his pork taco, but he didn't finish the other two that he ordered. Maybe I should have expected less from $3 tacos? Dunno. I think my $3 might have been better spent at Edison's for a slice of pizza. But...I seem to be in the minority in my opinion of Barrio, based on the other reviews I've read online. I have no plans to rush back and try it again, so I guess if I want a good vegetarian taco, I'm going to have to go to Deagan's on a Tuesday. But if you check it out, let me know what you think. Deans is pretty good (I think vegan night is Wednesdays). Lincoln Park Pub does a good bean vegan taco on Tuesdays. The beans are fantastic. I completely agree with you. Four of us went there on opening day and had the worst service I've ever experienced... I'm not even sure how long we were there waiting and waiting and waiting and having to re-order because they were out of most menu items. And then after WAY too much waiting, the waitress overcharged us twice and proceeded to argue that we were wrong. Not to mention that the teeny tacos are incredibly overpriced. AWFUL. I was hoping it was just the opening day craziness, but I've been back since and it hasn't gotten better. Very disappointing. I think this is a cool concept in a great location. And I also think that with a little bit of work, this place can be a lot better. Maybe my server was having a bad night? Maybe our ticket got misplaced? Who knows. This is still a very young restaurant so hopefully they can get the kinks worked out over the summer. Guy's opening is rough...We have worked a lot of kinks out and hope you'll come back and give us a try! I went there this past Sunday. My tacos were good, but we waited 50 minutes for them. Our server was very nice and apologized twice. Learn to control the door, only seat what you can handle. I will be back because of the server and Barrio bought our tacos. Good luck, I hope you are de-kinking daily. I'd like to thank Barrio for responding to this post. I can't imagine how tough it is to get a restaurant up and running. I hope that things continue to improve for you in the coming months. Hi! Just found your blog through the Fresh Fork Market website. Have you been to Momocho in Ohio City? They have really good tacos, including vegetarian ones!